The autumnal equinox has arrived, and over the last three days a modest number of migrating monarchs have flown into Cape May, but the overall numbers remain low. 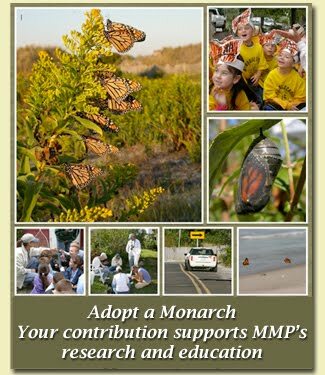 We are receiving a lot of questions for people who want to visit Cape May Point to see monarchs. If you've never been here before, and if you've never been to another migratory concentration point when the butterflies have been abundant, you'll probably be quite satisfied with a visit right now. Monarchs are being seen in many locations around the Point, from the trails at Cape May Point State Park to the private gardens in the residential area. Stroll around and you'll probably see dozens of monarchs. Monarch along the trail at Cape May Point State Park. If you've been to Cape May when monarchs are everywhere, however, we want to point out that it's not like that right now, and we haven't seen the first day of this migration season when the butterflies have been here in abundance. We expect that to happen sometime, but we can't guess when, other than to say that it usually happens after winds have switched to the northwest. Will it happen this weekend? It's possible, the winds are shifting today and we expect an hour or two with northwest winds, but there's a better chance that the numbers will remain fairly modest. migration at the tagging demo 9/21/18. There is something we can promise: each day this weekend, and every Friday, Saturday, and Sunday through Oct. 14, our Field Naturalists and volunteers will present one of our Monarch Tagging Demos at 2:00 pm in Cape May Point State Park. There is no fee for these programs, which are held under the east picnic shelter in the park (that's the one next to the Hawk Watch Platform). Good numbers of Ospreys have been migrating over Cape May Point. Since we mentioned the Hawk Watch, it's worth noting that there are many reasons for nature enthusiasts to visit Cape May Point at this season. One of the most popular activities is watching the hawk migration. Monarch numbers have been modest so far this year, but every day in Cape May is rewarding for lovers of nature.